As with past issues, we are working hard to keep the magazine coming on a regular basis. This issue took a little longer than normal, but we are already hard at work on the Fall/Winter issue. As always, without your help, there is no magazine, so send in those articles. After all, this is not only a magazine for the AGCRA, but also about and, most importantly, BY the AGCRA. With so many changes happening so quickly in the Army and the AG Corps, now is the perfect time to tell us how all those changes affect you and how you do business, or to help out your fellow Human Resources Soldiers with Lessons Learned and stories about events in your part of the world. We continue to place focus on the fastchanging personnel arena and, of course, any and all deployment tips, ideas, or lessons learned you care to share, but we also would like to see individual chapter updates or anything else that impacts the AG Corps. We gladly accept articles at any time. Please make sure that your article submission is in ASCII (plain) text with no formatting whatsoever, no word processing or publishing formats. Formatting it will only slow down our being able to get your article into the magazine since we have to remove all the formatting before placeing it into the magazine. Also, we welcome pictures but ask that you send them in JPEG (.jpg) format only. Lastly, please do not embed any of the photos into your article, but add them separately, along with a text file for their captions (who is in the photo, when it is, where they are, what they are doing, etc). 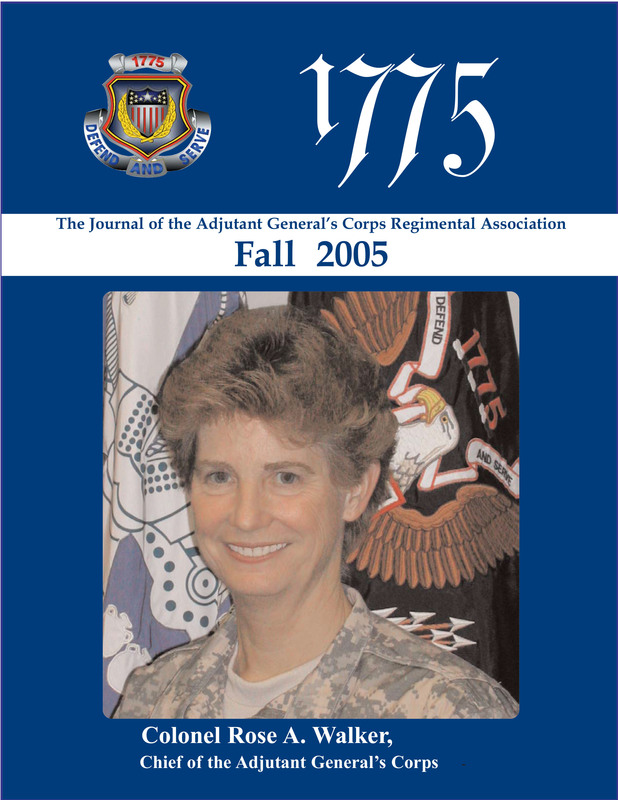 If you have any questions before you submit, please feel free to contact us at magazine@agregiment.com. Please make sure that you place 1775 at the beginning of the subject line for any email you send. This is important because unfortunately, we get loads of junk email and we don’t want your submissions, questions, and correspondence to get mixed into the spam pile. Also, just as importantly, we ask that you verify your current information on the AGCRA website. There are specific instructions on how to do so in the article on page 28 from our VP, Membership. The most common email we have received is “I didn’t get my magazine” and in 100% of these problems to date, the reason is that the address on file with the AGCRA is not the individual’s current address.